Nancy is our host for the color challenge at Just Us Girls. I was inspired by a shower curtain I saw online and switched it up a little to make my card. I hope you head off to see what the rest of the Design Team and our guest designer Stef Perry have made using these colors. If you make a card you may be chosen Chic of the Week and be eligible to be our guest in May. Love where your inspiration came from Bobby! Your card is CAS and yet bold! So pretty and so much depth with the way you colored them with the Oxide Inks! Simply beautiful! This is absolutely beautiful. I love those soft colors of the wildflowers against the blow background....stunning in their simplicity. I really like this card!!! Great use of these colors, Bobby! And interesting color challenge! I love those wild flower dies and only recently got mine from my bff as she had 2. They are such a keeper and what you have done here is fabulous. Perfect sentiment. This is great I love those flowers! Nice job with this week's challenge! So pretty! I love those dies and how you've used them! 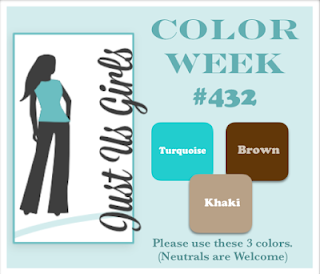 Great use of the colors too for this week!!! Those die cut wildflowers are so pretty and I think your epiphanies are something you should always listen to because this card turned out beautifully!